SPRINGFIELD, Mass. - Matt Delahunt has been the face of Hanover all season long, so it only made sense that when the Indians needed him most on Saturday, he was there to deliver. 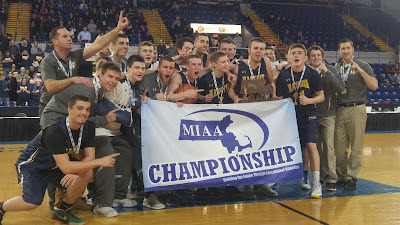 Behind 24 points and 9 rebounds from Delahunt, the Indians (23-3) captured their first boys basketball state championship in school history with a 58-43 win over Palmer in the Division 3 Boys Basketball State Final on Saturday afternoon at the MassMutual Center. The title is Hanover High School’s second of the year, with the Indians taking home a football state championship back in December at Gillette Stadium. Hanover coach Nick Hannigan said he knew the Indians’ star in Delahunt was due for a breakout game. Delahunt was not the only one firing from long range for Hanover. J.P. Landry knocked down a trio of treys, and Zach Chase, Aaron Boise, and Fredrick Damon all chipped in with one of their own as the Indians knocked down 12 three pointers in all. When Hanover was unable to find success from long range, Patrick Flynn – a University of New Hampshire football commit – provided second chance opportunities for Hanover. On both the offensive and defensive glass, Flynn was a beast throughout the contest, pulling in 15 rebounds. Palmer stayed within striking distance heading into the fourth quarter, trailing the Indians by 10, 41-31. Boise, however, started the frame with a triple and moments later, Boise tapped in a put back to extend Hanover’s lead to 15. The Panthers refused to go quietly implementing some full court pressure to get back in the game. Palmer was quickly able to get the game back to 10 points as two free throws from Ryan McCarthy and a three from Matt Niemczura cut Hanover’s lead to 48-38. Landry and the Indians, however, were not to be denied as two consecutive three pointers from the point guard put Hanover back up 18 with less than two minutes to play. Hanover had a 10-9 lead after one, but in the second quarter Palmer caught fire from behind the arc. Niemczura splashed one home from the top of the key to give the Panthers a 14-12 advantage, and moments later Jack Cookish hit one of his own to push Palmer in front. The two teams traded three pointers into the half’s final moments before a Landry basket and two free throws from Steven handed Hanover a 25-20 lead at half. Throughout the entire third quarter, it was the Delahunt show. Delahunt came out of the locker room and knocked down a pair of triples to push Hanover’s lead up to 11. Niemczura and Dylan Tenczar tried to weather the storm for Palmer, connecting on a pair of buckets. At the other of the floor though the Panthers had no answer for Delahunt. The senior star knocked his third three of the stanza and then an even deeper one moments later to increase Hanover’s lead to 10 going into the fourth.